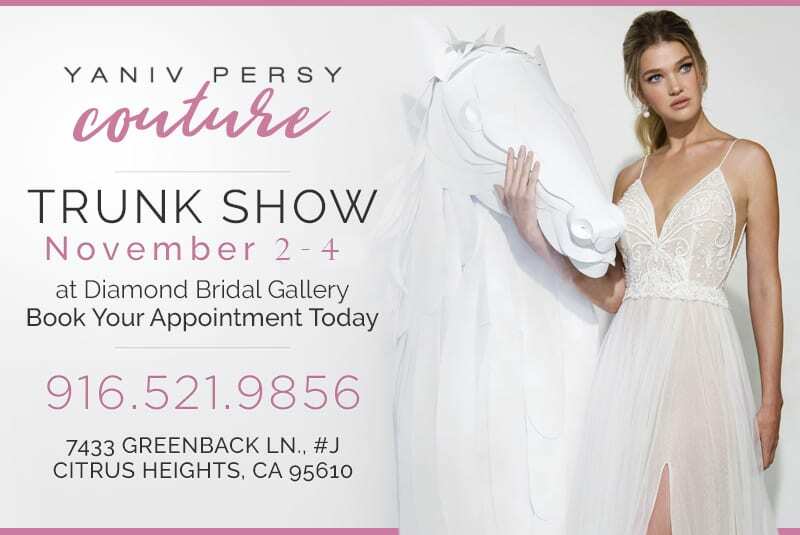 Parisian elegance, contemporary chic designs, and an artistic flair are at the heart of Yaniv Persy’s new bridal collection, coming this November to Diamond Bridal Gallery. The new “Affaire de Fleurs” collection is meant to ‘reflect a woman’s personality and femininity’ as well as what makes her unique. Embroidered rose florets, lace appliques, and hand stitching makes these ethereal bridal gowns truly stunning for Spring and Summer weddings. All gowns are in soft white, creamy ivory, or have just a touch of champagne, making this collection timelessly elegant. If you’re dreaming of a wedding dress with sleeves of straps, this collection also has a lot to offer, from illusion off the shoulder three quarter length sleeves to delicate draped straps and v-neck plunging necklines. Whimsical, effortless, and as beautiful as a flowers in the Spring, this is a trunk show you’ll want to see before it’s too late. Book your appointment today by speaking with a consultant. The trunk show runs three days only, from November 2nd through the 4th.